WordPress is perhaps the most popular and most commonly used content management system in the world. Its open sourcing means that designers and developers can make back-end website alterations behind the scenes. 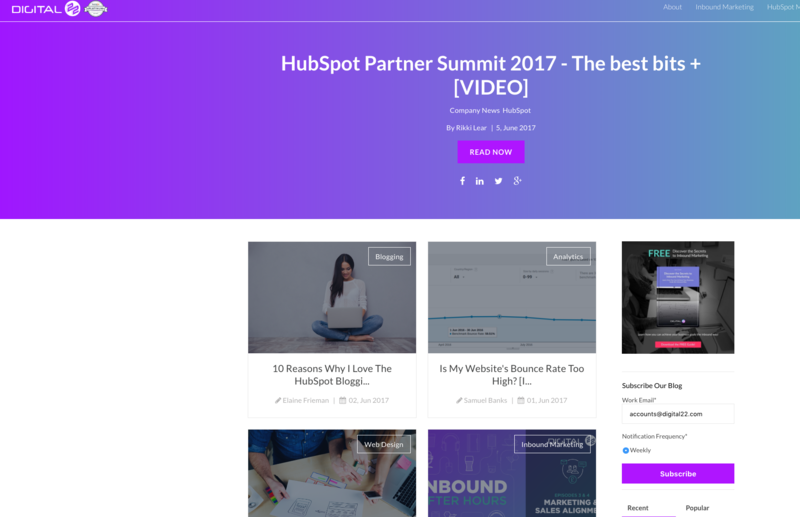 On the other hand, HubSpot COS (content optimization system) is an all-in-one platform where you can create web pages, blogs, and emails, and analyze it all in one system. Wordpress is made purely for creating content, whereas HubSpot is made for creating content and promoting it (social scheduling, optimization, sales, and so forth). Both systems have their plus points but in a battle of HubSpot COS vs Wordpress: which is the best platform to use? WordPress was originally built as a blogging platform, and has built-in blogging capabilities. You can set up RSS and email subscriptions, commenting capabilities, and add recent posts to your home page - or wherever you want to add them. If you want to add a calendar, a gallery, Twitter Feed, Facebook Fan Box, and other features, you have to add plugins - some are free and some are reasonably priced. The blogging tools themselves are easy to use, and don’t require coding knowledge (but you can see the source code if you wish). It works just like any rich text editor. As with HubSpot, there’s a distraction-free blog editor, the ability to schedule blog posts, and publish to social media. For mobile optimization, SEO optimization, CTA creation, content collaboration, content calendars, AMP support, and analytics, additional software is required but with HubSpot it’s all built-in - with no hidden costs or fees. As far as blogging goes, both are pretty similar in terms of ease of actually writing posts, but for marketers, HubSpot is the way to go because you aren’t using your blog to sell your content specifically - you aim to create industry authority on your given topic to lead your customers to your products; the goal isn’t to blog for the sake of it. For those who simply want to blog, on WordPress a non-customized domain with a small amount of storage (3GB) is free; custom domains start at £2.50 and range to £7.08 per month for 6-13 GB of storage; the business accounts start at £20.83 a month and come with unlimited storage, SEO, and Google Analytics tools available. HubSpot comes as a complete marketing and sales package, and doesn’t allow its software to be used solely for blogging purposes. The price for the complete package ranges from £165 a month to £1,960, depending on what your specific needs are. 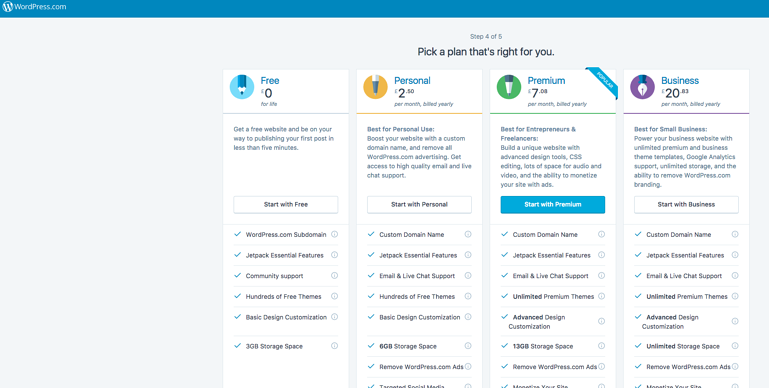 WordPress pricing for its website hosting isn’t entirely clear and can start around £50 per month and exceed go over £500 per month, but any personalization, software, and plugins cost extra. A sample of one of our landing pages. For marketing professionals, landing pages drive users deeper into content. In WordPress, LPs are built in a similar way to a blog, but adding a form, or personalizing the page for repeat visitors necessitates plugins and technical configuration (you’ll need a developer with PHP knowledge). HubSpot has in-built features to publish, test, and optimize your landing page without the need to download and configure extras. And, most importantly, without the need for developers (anyone in the office can build a landing page - even the non-technical like me). 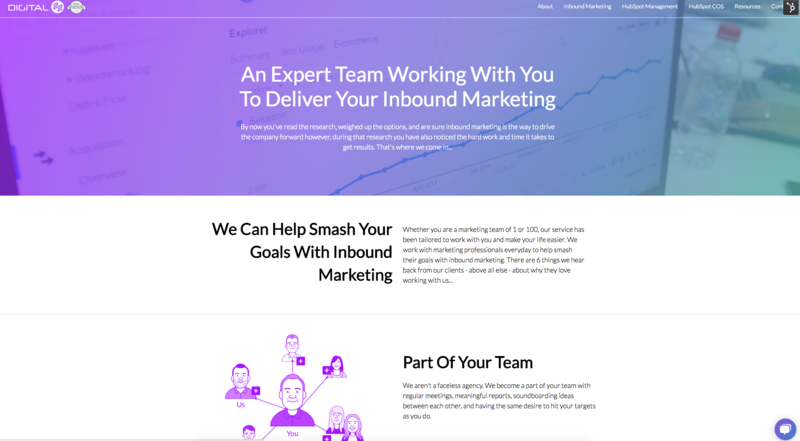 A sample of one of our website pages built by our design team using HubSpot. The web design in WordPress is fully customizable and scalable - you can have as many pages and blog posts as you want without it affecting site performance. You can also have multiple users to access the site from anywhere there’s an internet connection. Numbers indicate that WordPress is used for 25% of all internet websites, but many of these are individual users and are not for business purposes - so that data is slightly skewed. For marketing professionals who need to generate customers, convert leads, and close deals, you’ll need a fully integrated platform. With HubSpot web design you can create pages using drag-and-drop templates, optimize them for SEO, and use responsive design, which means if your visitor views you on mobile or tablet, the design doesn’t suffer and neither does their browsing experience. Both have on page SEO (meta descriptions, URL naming, and so forth), and content organisation for easy searching, but only HubSpot has competitor tracking, page performance tracking, and inbound tracking without the use of additional software. HubSpot is built with SEO in mind, and it adapts with the latest trends. WordPress does have SEO tools, but they are extras and not integrated. Unlike HubSpot, there’s the concern about how regularly these external third-party plugins are updated. HubSpot allows you to measure all analytic features at once: advanced content analytics, contacts, company analytics, competitor tracking, email reports, and revenue reporting. WordPress only allows for basic content analytics (sessions, visits, and so forth) without the use of extra plugins or software, such as Google Analytics. 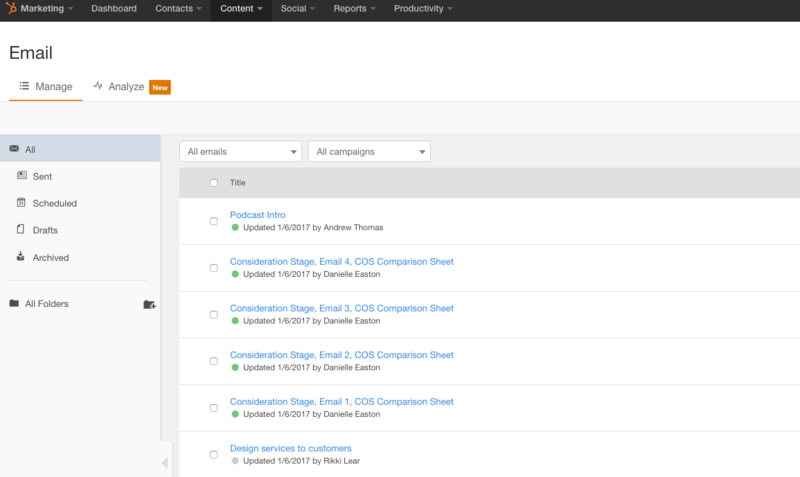 A small view of the email tool in HubSpot (off screen to the right is a tool to create a new email). Most CMS platforms are not designed to send emails, and have to be linked with an outside email sending provider, which means that if you go this method, you can’t track results with your website analytics. 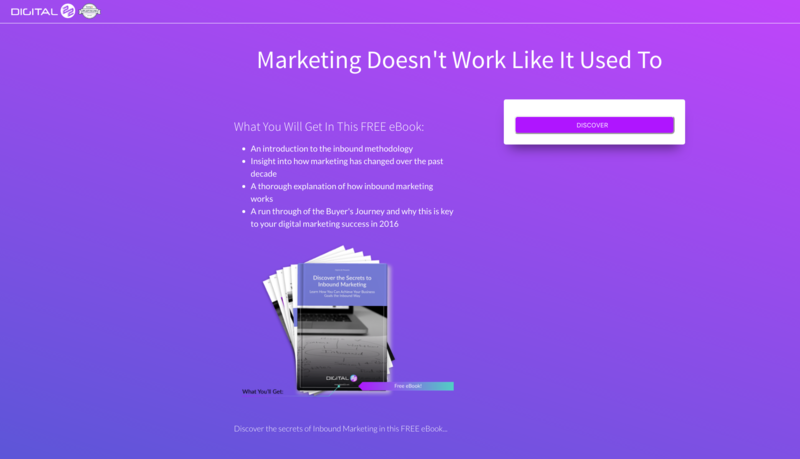 With HubSpot, marketing automation is part of the system already; whether you’re nurturing leads or sending automated blog roundups, you can do it in one place. You can even do A/B testing, personalize content, choose which lists are mailed to and which aren’t, and analyze their performance. WordPress can send some emails with outside software, but without the added features of HubSpot. The topics I’ve covered are by no means a comprehensive comparison of all of the features available from HubSpot or WordPress, but is designed to be a cursory overview of the two. From a marketing perspective, HubSpot offers the full package with software that has everything marketing and sales teams need to close the deal. WordPress can host content, but needs additional integrations and software to do a fraction of what HubSpot can do. It’s great for websites and blogs, but not so great in the marketing arena. Personally, from a blogging perspective, I feel the user interface for HubSpot is much easier to use. WordPress doesn’t automatically save your posts the way HubSpot does, and that may seem like a small grievance, but auto-saving is a lifesaver with HubSpot. In HubSpot too, there’s a menu button where you can view and/or return to a previous version. I can view a previous version, copy text I’ve deleted into the new version and I’m good to go. Even for blogging, WordPress requires plugins to do certain functions too, and no matter how cost effective the plugins are, when you’re paying for all features needed for your marketing, the costs can add up, and, even then, WordPress struggles to perform at the same level as HubSpot. Having smart CTAs and content personalization are features I would not like to miss when blogging, emailing, or social sharing. If you’re simply a blogger or you just want a business website and a blog, then WordPress might be the way to go, but if you want everything, HubSpot’s features cannot be matched - especially because, with the analytics tools, you can visually see and track how well your website, your blog, your emails, and everything else is working for you daily, monthly, weekly, or whichever parameters you wish to measure. In short, WordPress allows you to create content, whereas HubSpot allows you to grow it. To me, in the battle of HubSpot vs Wordpress, HubSpot reigns champion hands down. Let me know in the comments if you’ve used WordPress to host or blog and what you thought of it. If you’ve used HubSpot and WordPress, which do you think works best for your industry? For more information on HubSpot COS, visit our page here. 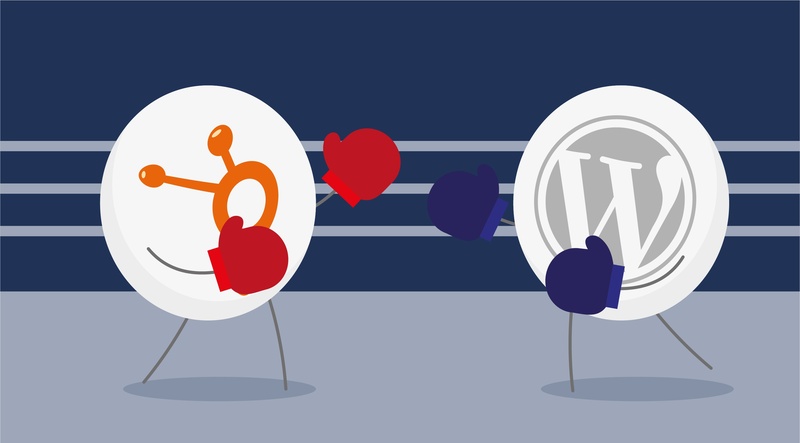 HubSpot vs WordPress vs Drupal: How do they compare? Download our FREE comparison checklist today. We compare the COS/CMS on over 20 points of comparison, so you can decide which platform will work the best for your needs.